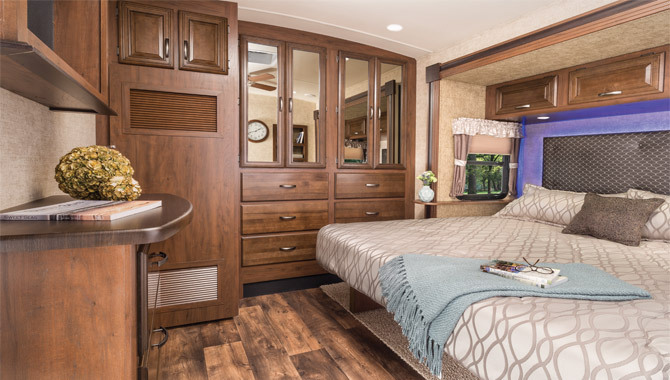 The two queen bed floor plan offers more sleeping space than any other RV layout! Two beds are a must when traveling with older children, parents, or another couple. Many times found in luxury RVs, this layout maximizes comfort and space. Traveling with another couple, extended family, or older children? You need two beds! Two queen beds or double bed floor plans offer extra sleeping space, so everyone has enough room for a good night's sleep. 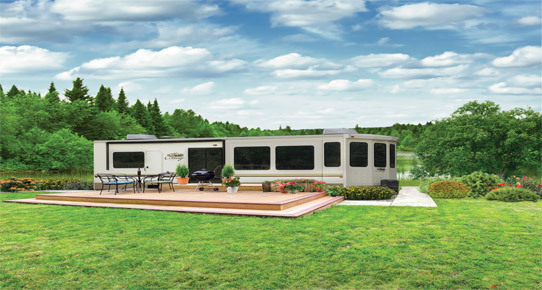 These floor plans are unique and are usually found in larger travel trailers, 5th Wheels, and destination RVs. Many times, one queen bed is located in a more traditional bedroom suite and the additional bed is found in the living room area as a convertible sofa. Two queen bed floor plans offer privacy and space when you need it. You'll find RVs offering two queen bed / double bed floor plans like travel trailers, 5th wheels, and destination RVs. Browse our online selection of RVs with floor plans that feature two queen beds or visit our dealership to see your favorite models in person.